I hope you all had a great weekend! We were busy playing at the Aquarium, went to a Jazz game and I got a chance to attend a MAC makeup class that a cute friend of mine taught and I snagged a few new amazing products that I can't wait to share with you all! I learned some fun new tricks too that I may have to share in a new tutorial. 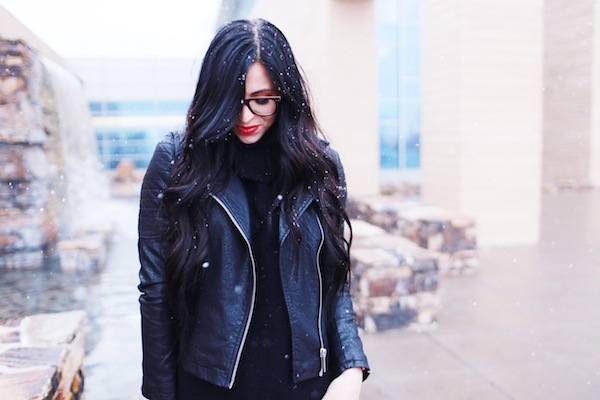 Today I am talking my new go-to…all black! I don't know what it is, maybe the weather, maybe the new dark hair, maybe it's because I love how chic all black looks... who knows! Whatever it is, I have been unconsciously picking out lots of all black outfits lately. I think it's partly because I am in love with these jeans (if you can even call them that- they are so dang comfortable!) and I wear them at least three times a week, so I end up pairing them with lots of cute black booties and black leather jackets. Let's be honest, no matter where you go, all black looks chic and put together, even if you're just wearing a black tee and black jeans! Since the all black head to toe look can be a bit much, I try and break it up a little here and there. These leopard rain boots were perfect for a snowy day and added a little fun to a simple look! Make sure to check out more of my favorites below and as always, thanks for following loves! Thanks for the post. It simply seemed to me like a fashion blog. The pics are really amazing and shows the real fashion statement of a person.